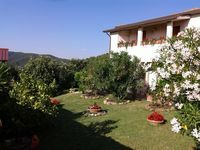 Property 25: Todi, Umbria, Country House with land of 2500 square meters and view over the valley. Property 30: Holiday Apartment "Il Sogno di Franco"
House in the quiet Umbrian region with pool and enclosed park. Property 33: House in the quiet Umbrian region with pool and enclosed park. I rented the whole villa for a spiritual retreat. It was a great home base for traveling to the local holy places in and around Assisi. The owner, Stefy, also cooked us delicious meals and taught us how to make homemade authentic Italian meals (as additional paid services that she offers). She connected us with a guide and a driver. So she provided great overall service and a country home away from home. The owners were really kind and gentle: they welcomed us with a nice snack and furnished us with food for breakfast. The house was very clean and comfortable. The proximity is calm and relaxing.